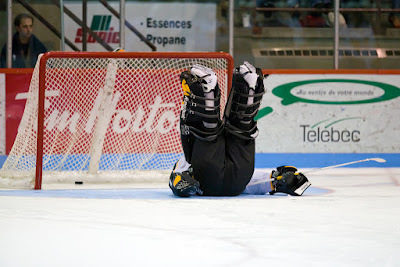 Recently I asked my goalie pals for some funny stories from the whacky world of beer league goaltending. Enjoy! MM: Worst is definitely the time I went to catch a far ice dump-in on my stick and missed. Ahhh I-league. NM: When I started playing goalie, I knew nothing of the gear or levels in the metroplex. Bought a set of roller gear, player skates and joined a c league team up at Nytex....needless to say I lasted 3 games before they replaced me. TB: Had Had Mexican food before a game and had baaaad gas. On a defensive face off just to the right of the crease the ref gets ready to drop the puck and as I get ready, rip a loud fart as I bend over. The ref and centers start laughing and he can't drop the puck. The ref looks at me and I apologize and we get ready for the puck drop. Repeat the process and this time loud enough to echo off the stands on the main rink at Nytex. My defenseman starts gagging and more laughter ensues. The other ref skates over and asks if I need to clean myself. SN: Once when I first staying playing back when I was 15 I forgot my cup and jock strap. Teammate gave me his cup and I tried to make a jock strap out of tape. Cup fell out a few times during that game. Another time during my first season or two my best friend was on another team. We were playing against each other and he was screening me. So I tried to give him a warning that I was going to belfour him. Shot comes in and goes 5 hole. I dropped my stick in the process while it was between his feet. Ref called interference on him and the goal was disallowed. Last one, maybe. There was a breakaway and my defenseman was sprinting to catch up. I don't recall if I stopped the puck or not but my defenseman plowed into me and flew into the net. Some how the net swayed while I was on my belly and fell forward on my back close to my neck. Everyone was silent but i heard my dad laughing shortly after I got up. AMcA: One of the worst things that I ever had happened to me while I was in net began with a play behind the net that ended with a player slashing me twice diagonally from behind the net across the throat, once as the whistle blew and once after. Another player shot the puck neatly into my glove while his buddy was slashing me across the throat the first time (which is horrifying as a Speech-Language Pathologist) and I quickly froze the puck and the whistle blew. Being the *ahem* petite goalie that I am I took umbrage to this whole procedure and proceeded to try to rip his spine out through his eye sockets. My defenseman grabbed me by the back of the jersey, yanked me away from him, then took my place pounding his face flat while I screamed obscenities at the window-licking fool. Needless to say that guy was meek as milk and didn't come within reach of my stick the rest of the game. TB: I have been known to sing in the net. Especially on breakaways. Everything from I've got a lovely bunch of coconuts to Disney show tunes to opera. Makes the shooters loose concentration and everyone laugh. JA Jr.: My wife flew back to NC to take care of her mom who is still battling cancer. I had one of those stupid late Friday night games at Nytex on a Friday night. So, I grab the girls, pillows, blankets, foam matts, and head up to Nytex. Ryan ends up breaking the glass in warm ups. The puck finally drops at 1250!!! Game ends around 2am. My girls were dead asleep in the Nytex halls under the tables that look into the Brahmas rink. My wife was not super thrilled when she found out. TB: NYTEX. Was playing C Lower for the Scorpions playing the Dekes on the small rink. Was losing badly, like 9-1. The Dekes had 3 guys in the stands that were drunk as all get out continually chirping. To the point that Christina (scorekeeper) kept turning the music up to drown them out. Well, after the 10th goal or so, one of the guys said something and I snapped. As everyone was resetting for the faceoff in center ice, I start removing my gloves, helmet, etc headed to the door closest to Zuroma's (I was on the far side. So I had to cross the blue line and center ice tog et there. I was at the door trying to get it to open yelling at the guys that if they wanted some, I was going to oblige them. Both benches by now are trying to figure out what is going on and the refs are also. I can't get the door open and one of the refs gets my attention and politely asks me to return to my spot. I apologize for making a scene and the 3 guys, who took off during this when they saw I was coming for them, returned, only to be ejected by the refs. I get back and dressed and the face off occurs. the ref skates over a little while later and I apologize again and he says I should have been penalized for 2 minimum, probably a match. I acknowledge this and he smiles and says, don't worry about it. Turns out the three guys in Zuroma's got harassed because everyone in there saw all of this unfold. they in turn got booted for drunk and disorderly I was told.